The traditional luxury of yellow gold takes a stylish update, courtesy of Apples of Gold. This cross pendant uses the Tau Cross as its emblem, forged of 14K yellow gold. A long symbol of Christianity, the Tau Cross in this pendant is given a flared edge on its three ends for a fashionable twist. A glossy shine all over the pendant is telling of the highly polished finish, and the warm, golden glow of this cross pendant makes displaying your faith a beautiful notion. 19mm x 16mm (3/4" x 5/8"). 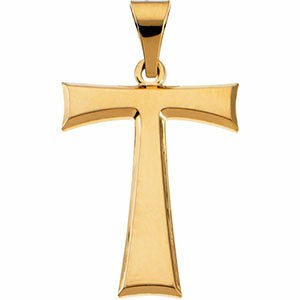 We guarantee our Tau Cross Pendant 14K Yellow Gold to be high quality, authentic jewelry, as described above.